In our study of Exponentials and Logarithms, we have seen various forms of exponential functions, how they behave graphically, how they are used to represent growth and decay, and how they are applied to financial situations. We are now going to take a look at how we can transform exponentials to play a role in the cooling process of liquids. at how we might tackle this problem with our past skills and then compare our results. Example: The brewing pot temperature of coffee is 180º F. and the room temperature is 76º F. After 5 minutes, the temperature of the coffee is 168º F.
a) Find an exponential function to represent this situation. a) Since this example is on a page relating to exponential functions, let's start with an exponential function. If the room temperature is 76º, we know that the coffee is not going to cool to a temperature below 76º in the open room. Since our first function is asymptotic to the x-axis (y = 0), we will need to shift this graph vertically to make it asymptotic to y = 76. When time is 0, we know that the coffee's temperature is 180º. 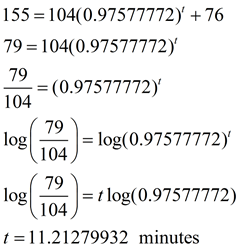 So (0,180) must lie on our function. We will use this information to find a. We know that after 5 minutes, the temperature of the coffee is 168º. So, (5,168) must lie on our function. 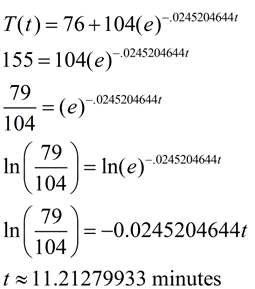 We will use this information to find b.
b) To find the time, set f (t) = 155 and solve for t.
Now, let's take a look at the "official formula" for Newton's Law of Cooling. According to Newton's Law of Cooling, an object's temperature change rate is proportional to its own temperature and the temperature of the surrounding environment. The degree to which a liquid heats or cools depends largely on the ambient temperature of the environment. (Ambient means "relating to the immediate surroundings".) In a general sense, the liquid's temperature continues to change until it reaches the ambient temperature of the environment. Newton's Law of Cooling also applies to the heating of liquids in relation to the ambient temperature. One assumption about the rate of cooling or heating is that the external temperature remains constant. 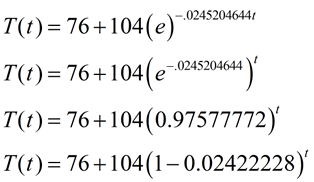 The first thing we notice is that Newton's formula uses the exponential e. The use of the e would imply a continuous rate of cooling and would yield a realistic result, as liquids cool continually. If we assume that the temperature of the object is greater than the temperature of the environment, our formula will be an example of exponential decay. Let's see how using Newton's Law of Cooling works in our example. Example AGAIN: The brewing pot temperature of coffee is 180º F. and the room temperature is 76º F. After 5 minutes, the temperature of the coffee is 168º F.
a) Find an exponential equation to represent this situation. b) How long will it take for the coffee to reach a serving temperature of 155º F.? 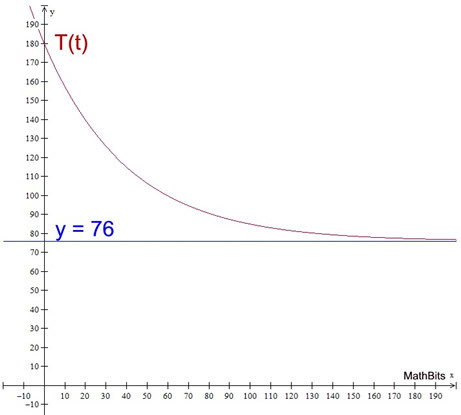 We need to find k by using that we know when t = 5, T (t) = 168.
b) How long to reach 155º F.? 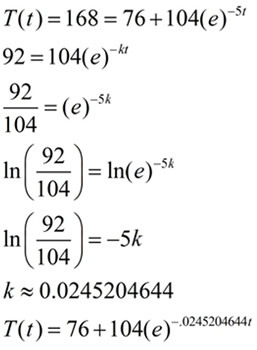 The r-value is negative indicating that this function is decreasing. decreasing by 2.422228% every minute. (as seen in the graph). You can see the similarities in the two formulas. The formulas are the same! And we just discovered that b = e-k .